The University of Louisiana at Lafayette Alumni Association will honor Dr. Steve Landry, UL Lafayette’s Provost and Vice President for Academic Affairs, with the Outstanding Alumni Award during Homecoming 2010 festivities this week. The Outstanding Alumni Award is the highest honor bestowed upon a former student by the Alumni Association. It recognizes outstanding professional and personal achievements that have brought honor and distinction to the university. To be eligible for this award, one must be a UL Lafayette graduate or former student having attended no less than 10 years ago. Landry will be honored during a reception Friday and will also ride in the parade Saturday. Landry, who was named UL Lafayette’s first Provost in 2008, will retire from the university at the end of the current fall semester. As Provost, he oversees all educational affairs and activities including faculty and research. Deans from each of the university’s academic colleges report to him. In addition to serving as Provost, Landry has also been serving as Vice President for Academic Affairs since 2000. Prior to that, he served as UL Lafayette’s Vice President for Research. Before holding that position, he was the Director of Research and Sponsored Programs. Landry has also served as an associate professor and department head in Computer Science and the Center for Advanced Computer Studies at UL Lafayette. He also served as director of the University Computing Center. 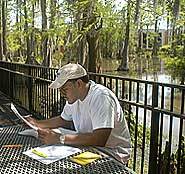 Before joining the UL Lafayette community, Landry was an assistant professor of Computer Science at Nicholls State University in Thibodaux and was a visiting research assistant for International Business Machines (IBM) in Colorado. He worked for IBM in Baton Rouge as a computer systems engineer. He received his Ph.D. and Master's degrees in Computer Science from UL Lafayette 1981 and 1975, respectively, and received a Bachelor's degree in mathematics from Nicholls State University in 1968. He is a member of various committees, professional services and associations including the Louisiana Education Quality Support Fund Planning Committee. He has also served as Vice President of the Louisiana Experimental Programs to Stimulate Competitive Research (EPSCoR) and as a member of the Louisiana Board of Regents Electronic Learning Committee and the Louisiana Partnership for Technology and Innovation. He has served on the Board of Directors for the Enterprise Center of Louisiana and is Chief Technical Advisor for the Louisiana Optical Network Initiative.